How eCommerce portals are using Social Media? Shivani reaches office every day at 10. After the usual early morning greetings, official mails and her cup of coffee, she logs on to Gmail, checks Facebook to see what her friends are up to, Tweets a bit about what her plan for the day is and logs on to Flipkart. She’s an avid reader and is a compulsive book shopper – so much so, that even being in office does not deter her from book shopping. Bookstores at malls are her favorite hang outs. Every day, she makes it a point to check if the latest one she set her eyes on is available at a better deal on Flipkart. The moment she comes across something of value to her, she goes on and buys it – without a second thought. She simply loves Flipkart because it also offers her a payment by Cash On Delivery (COD) mode – another +1 that gives a free rein to the compulsive shopaholic in her. Such is her life, full of eCommerce! A usual pattern? Well, for me it is. I know at least 5 such Shivanis in my immediate or extended friends circle. And it’s become a routine for them. The modern day lifestyle, hectic work hours, and a little leisure time may have ruined our sense of being but they have surely given a big push to the industry called e-tailing. So let’s take a look at really, who put the ‘e’ in eCommerce? Today, the internet users have grown by 20 times. It has brought together a 100 million people over the internet – searching and sharing content in seconds – with eCommerce carving out its own niche. The total eCommerce industry size currently is around $10 billion, out of which the travel industry alone contributes over 70%. Flipkart, eBay India, Fashion and You are some of the familiar names that are heard increasingly in familiar households. 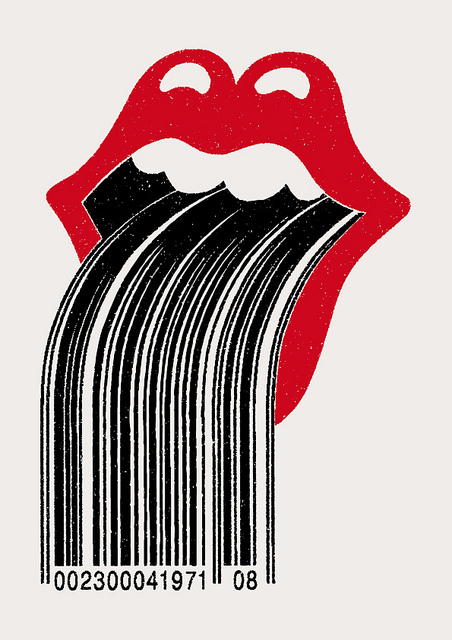 But what is it that has resulted in the big boom of e-tailing? Social media. It has given wings to the eCommerce industry to fly. Social platforms act as a medium that gets the buyers and sellers in direct contact on an everyday basis. In a world where everyone is pressed for time, there’s nothing like a simple tweet simplifying lives by telling us ‘what we need to buy’ in 140 characters. With over 45 million users, India has the second largest number of users on Facebook in the world. This implies that although the numbers quoted above have great significance, there is still a huge potential market that they can tap into. 1. 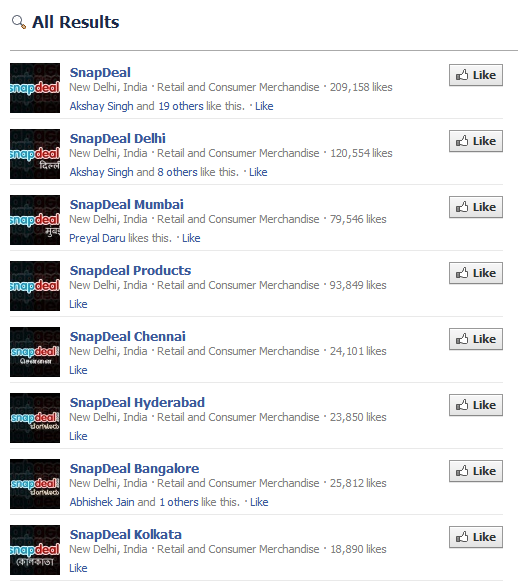 On both the platforms – Facebook and Twitter – Snapdeal has multiple properties for multiple cities. For example, you can like Snapdeal Facebook page for Ahmedabad on and follow Snapdeal Twitter property. The basic reason for doing this – Snapdeal works on a model that requires them to geo-target their audience and give them specific deals that they would be interested in, city-wise. 2. Flipkartis far ahead of its competition in terms of its Twitter reach. And surprisingly, every customer query is answered. Along with horizontal communication (admin to followers), there’s a lot of vertical communication (follower to follower) also that happens. Now this is much more than loyalty – this is a sign of brand love. 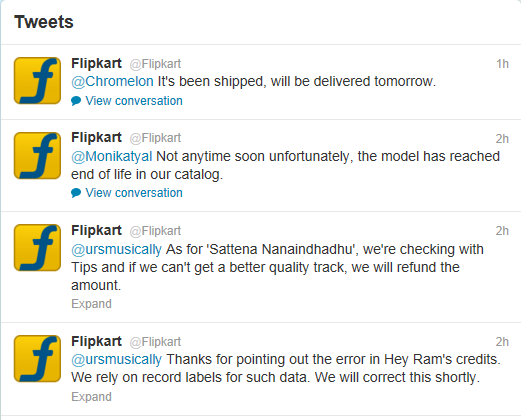 Apart from tweeting about contests, products, launches etc, Flipkart also uses Twitter as one of their customer support platform and this is actually in favor to its customers. 3. 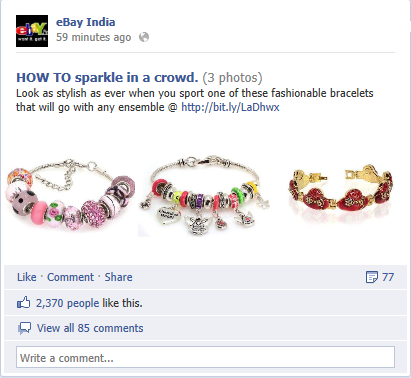 Ebay is the fourth most engaging brand amongst the Top 25 Indian brands on Facebook (source ). All these brands, like early adopters have started creating their Pinterest profiles also. This platform works extremely well for anything that needs only images for persuasion. eBay India–Ebay is a well received and a well-accepted name, globally. Its Facebook page and Twitter handle are visibly seen promoting contests and seasonal promotions. They also have a lot of product related posts. Fashion and You–This has a unique referral mechanism plugged into its Facebook page. Users on the page can invite friends and win freebies – vouchers, merchandise and a whole lot of other things. Fashion and You also owes its huge fanbase to the constant emails they keep sending. It is a big turn off, but it does have its own group of supporters. Flipkart – As a time when contests were particularly banned by Facebook on brand page walls, Flipkart realized the importance of Twitter and went out and about on it. It has periodic one tweet contests that have garnered significant followers for it. Infibeam–This has a host of applications for user engagement on its Facebook page. As regards its social media strategy, there’s nothing that this brand can boast of. Here’s a review from a dissatisfied customer. Read if you please. Snapdeal– Like it has been mentioned in this article before, Snapdeal has multiple city specific properties and if you see the combined Klout of all these properties, it definitely has to be more than any of the other top rankers that have been talked about in this article. Social Media allows eCommerce sites and portals to keep their customers in sync with the latest products available in the market – it is way better than other mediums – web banners, direct mailers, emailers and even mobile. After all this research, I’m convinced that although eCommerce lacks the physical experience that a normal store offers, it is here to stay. Despite this, there is one thing I found that none of these sites was doing. Imagine a normal web user who is considering buying a phone. What if there was a portal that made all his purchase decisions half as troublesome as they currently are? There are plenty of sites that offer good discounts, but not even one that offers an unbiased comparison of two closely placed products. While making a purchase, friends and influencers have varied things to say each day and this doesn’t help anyone in any way. Any of the social media managers for these portals listening?